Who Wants a Tooth That Tells Your Doctor When You Drink or Smoke? Everybody lies to their doctors. We say that we drink less than we do. We tell her we quit smoking when we didn't. But what if the doctor knew more about what goes into your mouth than you do? That's the idea behind a new Bluetooth-ready fake tooth that works as an oral sensory system. Your mouth makes unique motions when it does everything from eating and drinking to smoking and speaking, and this device uses a tiny accelerometer to record those movements. After detecting the signature motion going on inside your mouth, the electro-tooth sends the data up to your doctor who will probably soon scold you for all of your bad, unhealthy habits. A team of researchers from the National Taiwan University in Taipei are currently perfecting the device. So far it's performing great in tests. In a study with eight participants, the tooth recorded the correct activity with 94 percent accuracy. However, due to some engineering constraints, the prototype was connected to a computer and power source with a small wire leading out of the mouth, a simple but serious issue when it comes to usability. The researchers say the final version will be Bluetooth-enabled and battery-powered. When you step back and think about it, this tooth idea is kind of amazing. Why hasn't anybody thought of this before? Well, they have. Sort of. Last year, a team of engineers from Princeton and Tufts teamed up to build a so-called "tooth tattoo." 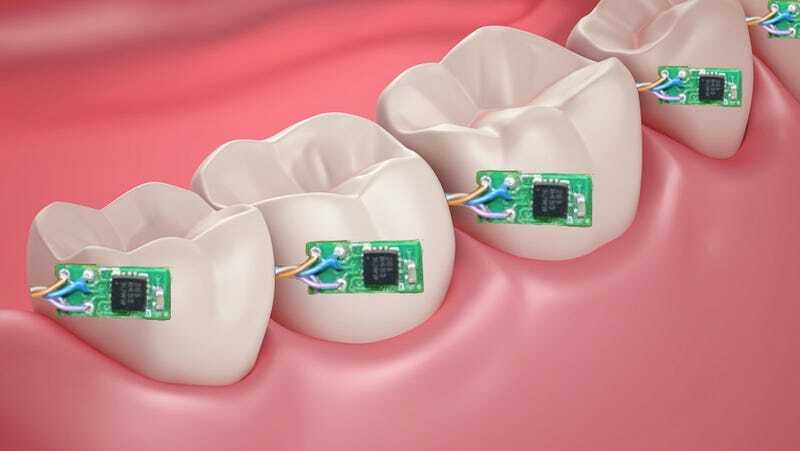 This tiny sensor made of gold, graphene and silk is applied directly to a patient's tooth and is designed to monitor the amount of bacteria in the mouth at any given time. These readings can help dentists diagnose and treat a number of conditions like chronic periodontitis, but with some simple tweaks, doctors say it could be used to monitor all kinds of health conditions. "The mouth is a window to the rest of the body," says Gerard Kugel, associate dean of research at Tufts. "You can spot a lot of potential health problems through saliva, and it’s a much less invasive way to do diagnostic tests than drawing blood."